-- The capital of Spain, located in the heart of the peninsula and right in the center of the Castillian plain 646 meters above sea level, has a population of over three million. A cosmopolitan city, a business center, headquarters for the Public Administration, Government, Spanish Parliament and the home of the Spanish Royal Family, Madrid also plays a major role in both the banking and industrial sectors. Most of its industry is located in the Southern fringe of the city, where important textile, food and metal working factories are clustered. 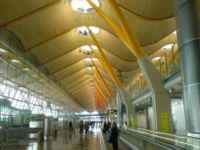 Madrid is characterized by intense cultural and artistic activity and a very lively nightlife. Madrid is a city of activity and peaceful walks. During the day the city bustles with energy, but come evening the central city becomes a frenzy of human activity as Madridians take their nightly excursions. Around the Puerta del Sol the streets become packed with people until well into the early morning. At the beginning of the 19th century, Joseph Bonaparte undertook the reform of the Puerta del Sol and vicinity. The commercial street known as the Gran V�a was built as an east-west avenue at the start of the century. In the 1950's the north-south boulevard called Paseo de la Castellana was extended and modern buildings were erected, housing the major financial institutions. Remainings of the distant past are mainly the Baroque and neoclassical strcutures of the 17th and 18th centuries, such as the Plaza Mayor (Main Square), the Palacio Real (Royal Palace) and others which will be described later during our guide of the city. The city Bus system is comprehensive and the bus stops are clearly marked with the destination indicated on each bus. It is recommended that a visitor purchases a "Metrobus" ticket that intitles the holder to ten trips either by Bus or by Metro. Disabled persons may board Buses displaying the words "Piso Bajo". Buses run from 06.00 to 24.00 hrs, and there are 20 Buses that run through the night on some of the routes. Madrid as a capital is served by six types of train service. The ALARIS ( Madrid to Valencia), the AVE (high speed link between Ciudad Real, Puertollano, C�rbada and Seville), the "Cercan�as" (commuter trains), the "Largo Recorrido" (long distance trains), the "Regional" (local trains) and the TALGO (long distance express). The one exception is the famous "Trens de las Frescas" (Strawberry Train)- a special train that runs between Madrid and Arnejuez at weekends from mid-April to mid-July, and mid-September to mid-October. Travellers on this train are served fresh strawberries! The Metro system in Madrid is inexpensive, fast, and easy to use. At every Metro station there are machines dispensing tickets for the journey. It operates from 06.00 to 01.30 hrs and has over 150 stations running on 11 colour coded lines. The taxis are painted with a red diagonal stripe on their doors. They have a green light lit on the roof of their taxi to indicate when they are available for hire and also display a sign "libre". Although there charges are inexpensive there is a minimum charge applied. There are a number of different Taxi organisations are there numbers are indicated in the table above. Created as from 1969 this is the new centre of commercial Madrid and also a location for exhibitions. Close on hand is the Estadio Santiago Bernabe� Staduim and home of Real Madrid Football. This street is famous for its fine shops specializing in luxury items of all types. Created in the 20th Century from mainly a slum area shows a mixture of different architectural styles. The main street is lined with shops, restaurants, cinemas and hotels. An old part of the city which is associated with the older culture of what was termed "the working class". Narrow steep streets with tall narrow houses reflect the character of these districts. Although Madrid has today bigger and better markets this one is the only one still remaining from the period when they were constructed with iron. Although Madrid has over 60 cinemas this is the heart with seven important locations in which major films are first exhibited. This attractive square features a beautiful sculture and fountains that have been adopted as a symbol for the city. 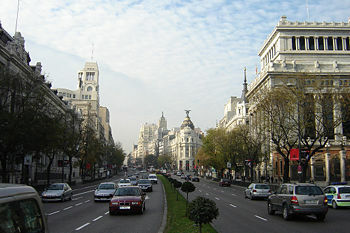 Around the square are located some of the most important buildings in Madrid. The square freatures a modern sculpture nd a neo-gothic spire style both honouring Christopher Columbus. The buildings surrounding this square create its character. Dating from 1617 the square was designed by the same architect as the El Escorial Palace. The square in its past was used for bullfights, pageants, executions and the public application of the Spainish Inquisition. Facades of the buildings surrounding this square have been restored or remolded. The Torre de los Lujunes dates back to the 15th Century and it was used for the imprisonment of King Francois I of France in 1525. The Town Hall which imposes its presence on the square was constructed in the 17th Century. Completed in 1778 this ceromonial structure was ordered by Carlos III. Noisy with constant traffic this square has played a significant role in Spanish history. It is considered the centre of Spain and all measurements radiate out from the Kilometer Zero plaque in the centre of the square. On the strokes of midnight on New Year's Eve the inhabitants of Madrid throng the square and swallow a grape on each stroke to bring them luck! 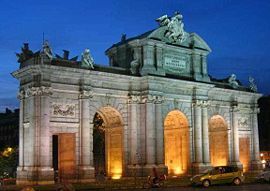 The square is dominated by a triumphant arc ordered in 1813 by Jos� I but due to fleeing back to France in 1814 it was later dedicated to fernando VII in 1827. The main feature of the headquarters of Madrid's watrer system is a water tower that has been restored in 1985 to provide an architectural sight! * Though cold, winter in Madrid is usually quite dry, and for those not looking for sun-tanning weather it can be a very refreshing time of the year to visit the city. It occassionally snows in the center, but it rarely accumulates. While there is certainly no shortage of activity in the city, there are far less tourisst than at other times of the year, resulting in smaller crowds at museums and other tourist centers, off-season rates at hotels etc. It is worth keeping in mind that the temperatures at night can go well below zero so make sure you get a room with proper heating. * SUITABLE CLOTHING: You'll want warm clothes, including sweaters, as heating is not guaranteed in many places. Though rain is relatively infrequent it can by no means be ruled out. A water-resistant jacket and umbrella should suffice, and a pair of heavy shoes or lightweight boots that don't mind getting wet are advisable. * Spring is one of the most pleasant times of the year to visit Madrid. The long days are generally warm and the nights cool. The nightlife goes up a notch, as the warmth seems to get the blood (and beer) flowing. Large numbers of young people take to the streets for the all-night 'marcha' and all the outdoor cafes open up. During Holy week ('Semana Santa', the week leading up to Easter) Madrid is usually fairly quiet as the Madrid masses head to the south for the processions and the year's first sun-tan. Rain is not uncommon at this time of the year, and days are often quite windy. * SUITABLE CLOTHING: You will have to allow for a range of temperature. Its very unlikely to get very cold, but it can get quite chilly at night, particularly if you go outside the center. At mid day the temperature can easily rise to short sleeve temperatures. Rain gear is recommended, as is a jacket to break the wind. * Temperature-wise, Madrid's summer should really be divided into two sections; the pleasant summer and very-hot-summer. The former may or may not last all through June, and then begins again in mid to late August. This is a good time of the year to visit Madrid, especially to enjoy the long warm nights in June, when the street life is at its best. In July and through most of August, the city simply gets very hot, with temperature frequently touching into the 40's (over 100 Fahrenheit). The real problem with this time of the year in Madrid is that it doesn't cool down very much at night, making sleeping uncomfortable for those without air-conditioning. 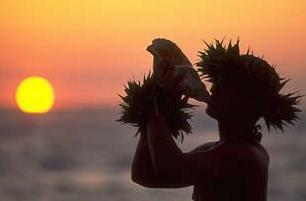 An important summer phenomenon is that in August the locals pour out of the city en-masse. Many people like it in Madrid this time of year, as the city has much less traffic (its actually possible to find a parking spot! ), the mood is quiet, many restaurants and shops are closed, but the ones that are open are likely to be much less busy than normal. If you like to have 'the city to yourself', then August may be the time for you to visit. If you're lucky, the cooler weather will return sooner rather than later. Rain is infrequent but there are the occasional summer storms. * SUITABLE CLOTHING: Short- sleeved shirts, shorts, sun glasses, hats to keep the sun off your head. Sandals are a very good idea, and Madrid is a good place to buy them. Sun cream if you are of fair complexion. * Like spring, autumn is an excellent time for a visit. The city's mood is quite different as everyone has recently returned to work or school after the August holidays, the temperature is very pleasant with people relieved that the intense July sun is behind them. There are also plently of cultural activities going on. Late in autumn there is always the risk of some rain, but its rarely so much that an umbrella can't cope. * SUITABLE CLOTHING: Like spring you have to bring clothes for a range of temperatures. Its unlikely to get so cold that a decent sweater can't cope though. Obviously the later in Autumn you go the cooler it gets.